As the holiday season approaches, many local lighting design organizations are hosting festive events! Click on their links for more information if you're interested in attending! Come celebrate and support local artists at work within the design community while enjoying holiday festivities at the BSA Space! Haley House Bakery Café and Roche Bros will provide delicious catered food and beverages. Admission is $15.00 USD and all ticket proceeds will be donated to Rosie’s Place. We ask that you also consider bringing a donation from the Rosie’s Place list of most needed holiday items: newly-purchased sets of hats, scarves, gloves or $25.00 USD gift cards for CVS, Walgreens, Target, Payless, or Old Navy. Guests will also have the opportunity to participate in an onsite fundraiser to benefit Rosie's Place. 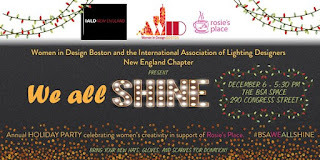 Don't miss your chance to win fabulous prizes including Philips Hue Systems, ICA Gift Card, Boston Roller Derby Pass, A Custom Portrait, Art Classes, LivOriginal Jewelry and more! Please RSVP by clicking this link! For questions, please email IALD New England Co-coordinator Haley Darst, Associate IALD, at hdarst@CANNONDESIGN.COM. It's the most wonderful time of the year ... when the best and the brightest in the lighting industry don their festive bowling attire and show off their mad bowling skills! Whether you plan to attend and just observe (while enjoying tasty treats and beverages) or join one of the die-hard teams out on the lanes, this is a seasonal tradition not to be missed! RSVP: Register using this link!